I smiled when I read this recent Buzzfeed post on 16 Supposedly Healthy Foods that Contain More Sugar than a Snickers bar. I do this sort of thing at home all the time, converting the grams of sugar in foods and drinks my family likes into teaspoons, then comparing to, in our case, a 12-ounce Coke. It drives them crazy, but how else will they relate? Until sugar content is listed in teaspoons, not grams, with added sugars (the ones you should avoid) and naturally occurring sugars (the ones you should stress less about) listed separately, I’m doing the math: roughly four grams of sugar are the equivalent of one teaspoon. Simply divide the total grams of sugar in a product by four to figure out the teaspoon equivalent. So if a drink contains 40 grams of sugar, like that can of Coke, you’re talking 10 teaspoons of sugar. I was working on a story on added sugars several years ago and served my son a glassful of 12 teaspoons of sugar with breakfast. It was the amount of sugar in a typical serving of his favorite orange juice. “This must be a joke,” he said. Nope. The amount of added sugar in most processed foods will astonish you. Need your own visual? Check out sugarstacks.com. It’s the same story with my husband’s favorite orange “natural” soda. He feels good about drinking San Pellegrino’s Aranciata because it’s sold at Whole Foods, contains 16% fruit juice, and is made in Italy. Besides, isn’t San Pellegrino known for mineral water? But here’s why Sean should can it: The Italian orange-flavored soda contains 32 grams of sugar – eight teaspoons worth – while also being nutritionally useless. 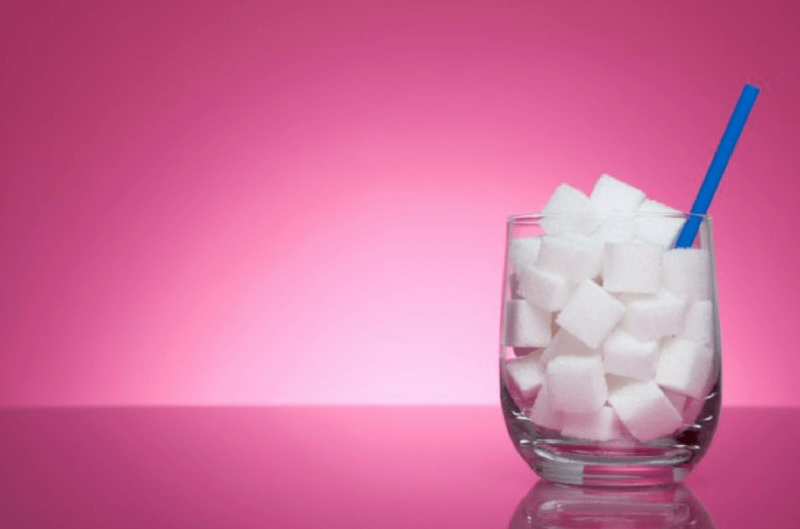 That’s typical for processed foods and drinks with added sugars – they offer nothing you need and everything you don’t. While the sugar wreaks havoc on the body (added sugars are associated with weight gain, type II diabetes, inflammation, heart disease, even certain cancers), the empty calories from added sugars displace foods and drinks we should be eating. Like the actual orange. 1) spot added sugars in ingredient lists, including (but not limited to): sugar, white sugar, brown sugar, brown sugar syrup, brown rice syrup, turbinado sugar, granulated sugar, confectioner’s powdered sugar, beet sugar, invert sugar, corn sweetener, corn syrup, maple syrup, malt, molasses, honey, dextrin, dextrose, fructose, maltose, sucrose, lactose, cane juice, nectars, and fruit juice concentrate. 2) memorize the 4 grams per teaspoon formula and start subtracting added sugars from your diet, one orange soda at a time.